On October 1st 2018, the state of Pennsylvania officially adopted the 2015 Building Codes (IRC, IBC, etc). Please be aware that building plans submitted to the township after that date must comply with the 2015 Building Codes. The Board of Supervisors is scheduled to meet for the April Work Session at 8:30am on Tuesday April 9th and the regular monthly meeting Wednesday April 10th at 7:30pm. Agendas are available under the “Township Government” tab. Sign up to receive emailed monthly newsletters and alerts at the bottom of our home page! Stay tuned into what’s happening in our area. Make sure you look for the verification email to confirm! TreeVitalize is a public-private partnership established by DCNR to help build capacity within communities to plan for, plant, and care for trees, and to offer educational trainings to help citizens understand the diverse benefits of trees and the importance of properly planting and maintaining them. TreeVitalize offers a broad range of services to support sustainable urban and community forestry programs across the state. Recently, new township maps were mailed out to all residents. 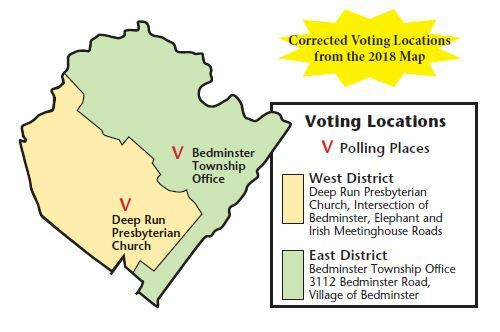 We are aware that there is a mistake in the identification of the voting district addresses and we are working to resolve that. Thanks for your patience! The Board of Supervisors approved a revised fee schedule at the February 14th meeting. View the updated fee schedule here. The 2018 budget is approved and can be reviewed here. Bedminster Township requires a Resale Use & Occupancy permit for resale of homes in the Township. For more information, click here. Requirements for building permit submissions have recently changed. Read about the new requirement here. The Township has recently received applications for inclusion in the Agricultural Security District which are now being processed. Any farmland owners interested in becoming part of the Agricultural Security Area, please complete this application and forward to the Township Administrative Office, 432 Elephant Road, Perkasie, PA 18944. It’s pothole season! Report potholes on PennDOT roads by calling 1-800-FIXROAD, or online at PennDOT’s customer care center. Not sure if a road is Township or PennDOT owned? Check our list of PennDOT Roads. LIHEAP (Low-Income Home Energy Assistance Program) Information here. Visit BedminsterCitizens.org to learn more about this organization and how to get involved in maintaining the rural character of Bedminster Township, and support growth that preserves the environment, our history and way of life. Ten months ago, the Township’s administrative staff relocated from the Township & Police headquarters at 3112 Bedminster Road to the Township’s Annex building at 432 Elephant Road. The Township’s new address is 432 Elephant Road, Perkasie PA 18944. This move does not affect the voting locations, they will remain the same. 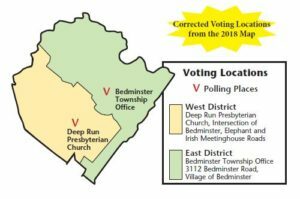 The police building at 3112 Bedminster Road will continue to be open on election day for those in the Bedminster East voting district. 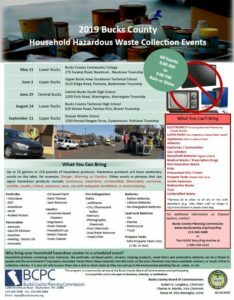 TO FIND OUT HOW TO PROPERLY DISPOSE OF OR RECYCLE OTHER MATERIALS OR ITEMS, visit Earth911.com. 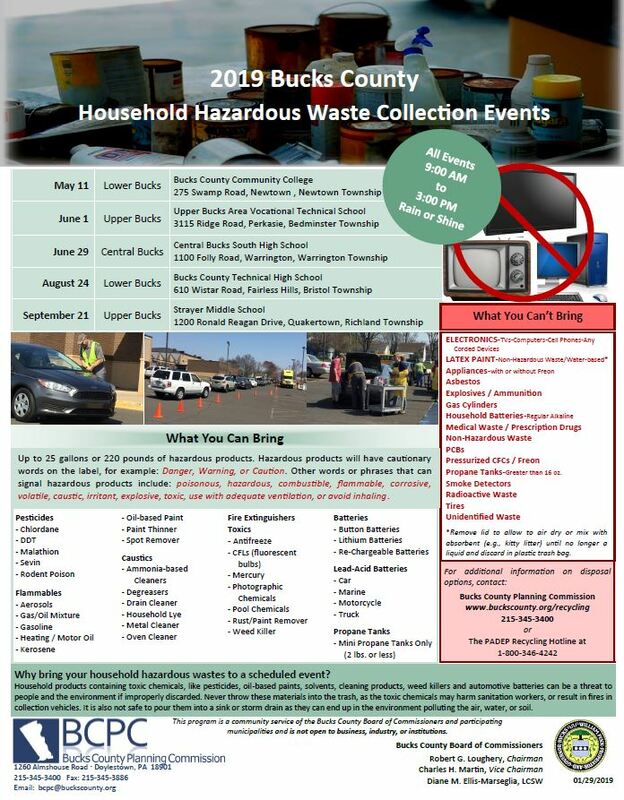 Just type in the material and your zip code, and find a place to take your items! To report potholes, signage issues, brush and tree removal, and animal carcass removal on a state-owned PennDOT roadway, call 215-345-6060. To see a list of State Roads, click here.